Being the Mother of dragons is cool and all, but sometimes instead of summoning a dragon, you just need to shoot somebody full of holes. Besides, bringing both guns AND dragons to a sword fight insures that you will win. This Sig Sauer P220 has been customized with a House Targaryen theme. Yeah, let the invading army come. They are going to get a big surprise as they swing their swords and fall to this magical machine. Yeah, Danny has got this one! Assuming she has enough bullets. 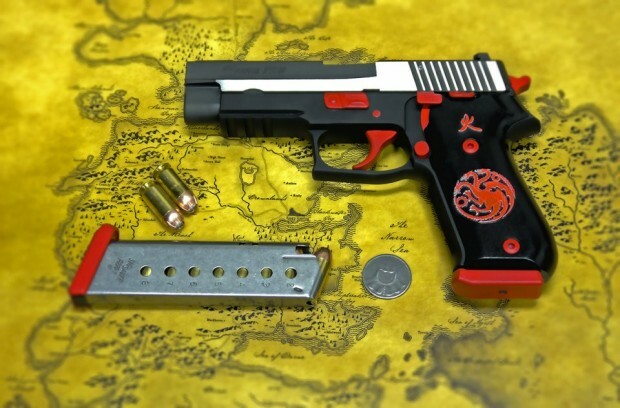 Why we need a Game of Thrones handgun, I have no idea, but it’s cool. I suppose it’s only appropriate, since Danny is a real pistol.